Are you looking for Yamaha Motor Company Limited jobs? Yamaha Motor Company Limited has announced vacancies for any graduates. Want to apply for it? Scroll down for more details..Apply soon. Company Name : Yamaha Motor India Sales Pvt. Ltd.
Company Profile : Yamaha made its initial foray into India in 1985. In August 2001, Yamaha Motor India became a 100% subsidiary of Yamaha Motor Co., Ltd, Japan (YMC). In 2008, Mitsui & Co., Ltd. entered into an agreement with YMC to become a joint-investor in the company "India Yamaha Motor Private Limited (IYM)". IYM's manufacturing facilities comprise of 2 State-of-the-art Plants at Surajpur (Uttar Pradesh) and Faridabad (Haryana). The infrastructure at both the plants supports production of motorcycles and parts for the domestic as well as overseas markets. With a strong workforce of more than 2,300 employees, IYM is highly customer-driven and has a countrywide network of over 1200 customer touch-points including 400 dealers. Presently, its product portfolio includes YZF-R15 Version 2.0 (149.8cc), Fazer (153cc), Fazer Version 2.0 (149cc), FZ-S (153cc), FZ-S FI Version 2.0 (149 cc), FZ (153cc), FZ FI Version 2.0 (149 cc), SZ-S & SZ-RR (153cc), SZ - RR Version 2.0 (149 cc), Saluto (125cc), SS125 (123cc), YBR125 (123cc), YBR110 (106cc), Crux (106cc) and Scooters Ray (113cc), Ray Z (113cc), Alpha (113cc) and Fascino(113cc). Its import portfolio includes VMAX (1,679cc), YZF-R1M (998 cc), YZF-R1 (998cc) and FZ1 (998cc). Yamaha made its initial foray into India in 1985. Subsequently, it entered into a 50:50 joint venture with the Escorts Group in 1996. However, in August 2001, Yamaha acquired its remaining stake as well, bringing the Indian operations under its complete control as a 100% subsidiary of Yamaha Motor Co., Ltd, Japan. 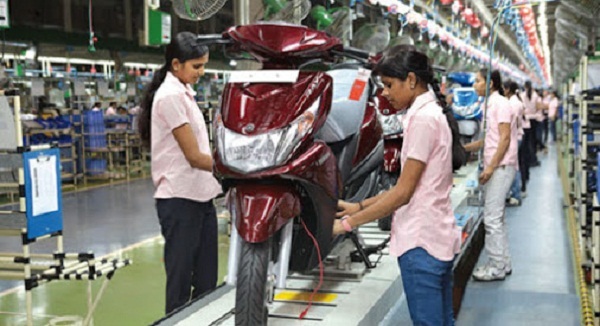 India Yamaha Motor operates from its state-of-the-art-manufacturing units at Faridabad in Haryana and Surajpur in Uttar Pradesh and produces motorcycles both for domestic and export markets. With a strong workforce of 2000 employees, India Yamaha Motor is highly customer-driven and has a countrywide network of over 400 dealers. Yamaha Motor India Sales Pvt. Ltd. (YMIS) is a 100% subsidiary of YMC. YMIS is established by YMC to provide Sales & Marketing services to IYM. Headquartered in Chennai, YMIS supports IYM to market and sell its motorcycles & scooters in domestic as well as export markets. Yamaha Motor Research & Development India Pvt. Ltd. (YMRI) is a 100% subsidiary of YMC. YMRI is established by YMC to provide R&D and Product development services to IYM. Headquartered in Surajpur, Gautam Budh Nagar (U.P. ), YMRI is engaged in developing new products for IYM for its domestic as well as export markets. YMRI is the fifth overseas R&D headquarters for Yamaha Motor Group following Italy, Taiwan, China, and Thailand. 1. To co-ordinate with Sales Channels for spare parts trouble shooting in market. 2. To instruct parts management & operations to dealers. 3. System introduction at dealerships. 4. To conduct training orientation for dealers & concerned staff. 5. To keep higher service ratio at Dealership by inventory management for better customer satisfaction. 6. Money collection from Dealers. 7. To conduct Parts Sales Promotional Activities. 8. To achieve Sales targets for Parts, Lubes & Helmet Business. 9. To collect information on competitor Marketing & Sales strategies. This is a sales profile and requires travelling to different cities for 15 days in a month.